The past year has seen some major changes in my brew practices, most prominently in the transition from extract to all-grain. It has been fun to stretch my abilities and add new techniques to my toolkit, although not without its frustrations, either. There is a whole new learning curve to master! One of the toughest projects has been to master my mash efficiency. Where you can get really, really consistent gravities quite easily with extract (I would rate this as a big “plus” for extract brewing), I’ve found less consistency in my all-grain. From my reading and conversations with other brewers, “crush” hits the top of the list for improving efficiency. So, with that in mind, I purchased a two-roller mill from Monster Brewing Hardware. Their mills are pretty consistently well-rated, so it seemed wise to follow that reputation. It will be really nice to be able to control my crush more precisely–the local homebrew shop generally gave me good results, but now I can mill grains exactly to my home specs. 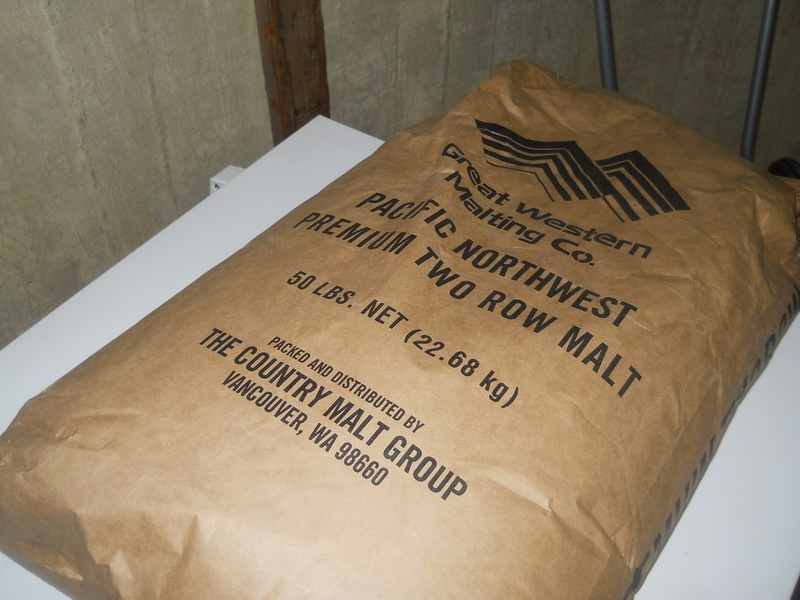 This also makes it logistically easier to get big bags of my base malts (see photo). By buying in bulk, I can cut the per batch cost significantly. It took me a bit to figure out what I wanted to brew for the first batch with my new mill. I had thought about a simple amber ale–but, I already have a fair bit of IPA and pale ale on hand (and apparently an amber ale is just a variant of a pale ale–makes sense, but I hadn’t thought of it this way before!). So, a good porter seemed like a great alternative. It will round out my beer stock nicely. After a bit of thought and searching, I elected to go for a clone recipe that I’ve tried versions of before. One of my favorite beers is the Edmund Fitzgerald Porter, courtesy of Great Lakes Brewing. It’s tough to find out in California, but I have had it a few times on tap or in the bottle when in the midwest or out east. For this batch, I stuck much closer to the original recipe from the North American Clone Brews book. The only mild variation was to have Cascade as strictly an aroma (steeping) hop at the very end, mainly because I forgot to pick up a little more at the store. I mashed in with 4.3 gallons of water at 172°. As measured 20 minutes later, the temperature was stabilized at 154°. After 1 hour, the temperature was down to 152°. I added 0.75 gallons of water at ~185°, stirred, and let it sit for 10 minutes. From this, I collected ~3.1 gallons of wort. I did have a slightly stuck sparge (first time ever!) towards the end of the collection, but was able to unstick it by stirring the top of the mash slightly and blowing air up the tube. Then, I added 3.25 gallons of water at 190°. After stirring, the mash stabilized at 168°. I let the mash rest for 10 minutes, vorlaufed, and collected 7.1 gallons of wort. I suspect I got so much because there was more wort left than usual in the first round of the batch sparge. The 7.1 gallons of wort had a gravity of 1.046. This equals 72% mash efficiency. Once the boil started, I added the Northern Brewer hops. After 30 minutes, I added the first addition of Willamette hops. At this point, the wort volume was down to ~6.75 gallons. After 75 minutes, I added the Irish moss. Wort volume was down to 6 gallons at this point. After 90 minutes, I added the Cascade hops, turned off the heat, and chilled the wort using my wort chiller. It took ~30 minutes to chill the wort to 80°. I whirlpooled the wort, transferred it to the primary fermenter (with the Venturi pump in use for aeration), and pitched the rehydrated yeast. The beer was visibly bubbling within a little more than 12 hours. The end result was 5 gallons of wort into the fermenter, with a starting gravity of 1.060 at 60°. I am fermenting the beer at 65°. This batch was brewed on 30 August 2014. This entry was posted in all-grain, porter, robust porter and tagged Edmund Fitzgerald Porter Clone. Bookmark the permalink.